The Chemical Guys Green Angle Head Wheel Brush is the perfect tool for cleaning OEM and custom wheels, tyres, fender liners, textured plastic trim pieces, undercarriages, suspension parts, and MORE. The Chemical Guys Green Angle Head Wheel Brush is the perfect tool for cleaning OEM and custom wheels, tyres, fender liners, textured plastic trim pieces, undercarriages, suspension parts, and MORE. Due to the wheel being in the way, wheel wells and fender liners are hard to clean thoroughly. You can try to reach round the tyre with old rags or a small brush, but the reality is, you can never get a full clean. The fully-synthetic brush is tough enough to remove dirt and grime particles, yet soft enough to not scratch painted, chrome, powder coated, and polished wheels. 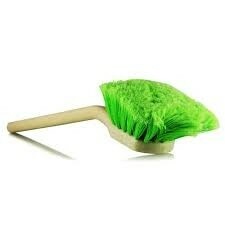 Soft flagged-tipped green bristles gently scrub and lift dirt and grime from wheels for a scratch-free shine. The extra-long handle and angled head allows the brush to slip between the tyre and wheel well for an easy and efficient clean of rubber, plastic, and carpeted fender liners. The plastic handle is scratch and abrasion resistant making it durable. It will also not damage wheel finishes if accidentally rubbed or bashed against the surface. Quickly clean away brake dust, dirt, oil, road grime, and more with this extra long Angle Head Wheel Brush.